The Tisdale Township properties consist of a 31.5% ownership in 12 mineral claims known as the "Davidson-Tisdale Property" and a 100% interest in 15 mineral claims known as the "North Tisdale Property" as well as certain surface rights (collectively, the "Properties"). The remaining 68.5% of the Davidson-Tisdale Property is owned by Lexam VG Gold Inc. San Gold initially acquired the Properties from Laurion Mineral Exploration Inc. in January, 2010, but has not undertaken any exploration or development work on the Properties since that date. Davidson Tisdale is a high-grade gold deposit located in North-Eastern Timmins, Ontario. The property is a joint venture of which Lexam VG Gold owns 68.5% and SGX Resources owns the remainder. Davidson Tisdale was subject to minor production in 1988 by Getty Canadian Metals, with a total of 7,300 ounces of gold being mined. The property is located approximately 5 km along strike from three mines -- Hollinger, McIntyre, Coniarum, which have produced over 31 million ounces of gold. Davidson-Tisdale consists of 10 claims totaling 520 acres in the Tisdale Township neighboring the prolific Timmins gold mining camp.Davidson-Tisdale was discovered in 1911 and has been explored intermittently over the years with a strong focus on the historical underground workings. Much of the drilling has been concentrated on two main areas with the deepest hole intersecting mineralization below 400 meters. Previous drilling results have yielded highly encouraging grades over good widths. Several shafts have been developed on the property with a decline ramp driven to a vertical depth of 150 meters. Successful high-grade deep drilling has indicated this deposit is open at depth and has the potential for further bonanza grades. To date, over 71,000 meters has been drilled on this property and it still remains a great target for exploration. Lexam VG Gold Inc. is planning to test the potential at depths and other areas for high-grade gold mineralization. 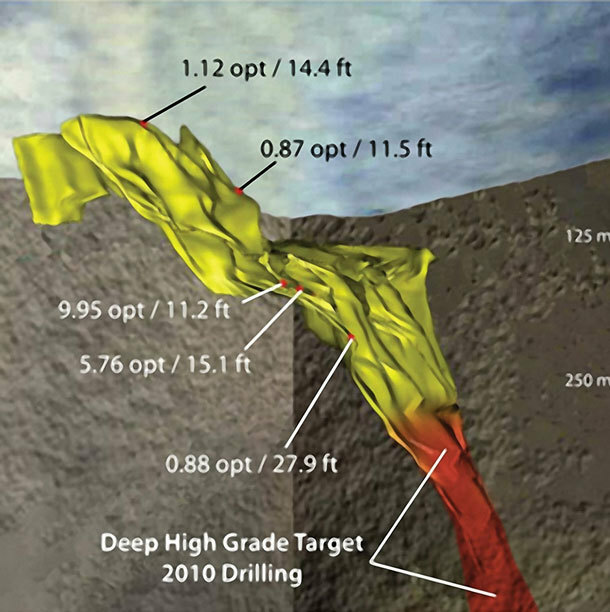 In March, 2007 an Exploration Report and Resource Estimate Technical Report on the Tisdale Project was published. (1) Mineral resources which are not mineral reserves do not have demonstrated economic viability. The estimate of mineral resources may be materially affected by environmental, permitting, legal, title, taxation, sociopolitical, marketing, or other relevant issues. (2) The quantity and grade of reported inferred resources in this estimation are conceptual in nature and there has been insufficient exploration to define these inferred resources as an indicated or measured mineral resource and it is uncertain if further exploration will result in upgrading them to an indicated or measured mineral resource category.